When the thermometer outside starts creeping toward that 100-degree mark your air conditioner is going to begin struggling. Even running at maximum capacity, can only keep the air inside about 20 degrees cooler. Once the temperature goes past 100 degrees outside, the interior of your home still isn’t going to get much cooler than 80 degrees. Prolonged periods of scorching hot temperatures quickly burn up your air conditioner and may eventually cause your unit to tucker out. Set a higher temperature – Resist the urge to turn down the temperature on your thermostat. You’ll be putting an extra burden on your system and it won’t have much effect on the ambient temperature anyway. In times of climbing temperatures, try to keep your thermostat set no lower than 78 degrees when you are home – and 82 degrees when you’re away (pets included). Water it down – If you have a lawn sprinkler, you can adjust it to sprinkle water on the exterior unit when temperatures go over 95. Or simply spray it with your garden hose. This helps lower the Freon temperature inside the unit, which in turn can lower your home’s interior temperatures by about 10 percent. Keep it clean – Make sure your AC unit is kept cleaned and regularly maintained. The compressor has to work harder when it’s dirty and dusty, so cover it when you’re not using it and make sure it’s not being clogged up by organic debris and grime. If your air conditioner is older (12 years or more), it may be best to simply replace it. 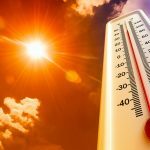 Air conditioners have to work harder as outside temperatures soar because the outside temperatures have to be lower than the heat being released from the unit. The higher the temperature of the outside air, the less cooling is done by the heat exchanger instead of the compressor. Trying to get older compressors to keep up with extreme conditions of high temperatures becomes cost prohibitive. Discuss your options with a trusted local HVAC company in Phoenix – and be ready for the next heat wave of the Arizona summer months. We have been serving Phoenix and the Valley since 1974 and can help with all of your air conditioning repair and replacement needs.